Email remains an extremely reliable and popular way for brands to communicate with their audience, with an enviable return on investment. Though there are few signs of adoption waning, many marketers are working to head off future problems of relevancy by embracing sophisticated data practices and emerging technologies. While there is concern that newer messaging platforms will cannibalize the email audience, in general younger cohorts remain loyal to email. Still, as email volume increasingly grows each year, it’s likely that users are becoming more particular about their desire for more tailored messages. 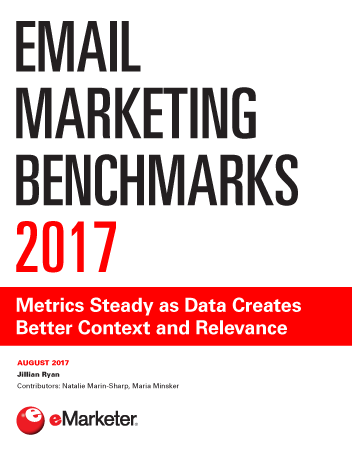 Email performance benchmarks are steady: Opens are up across all email service providers, but click rates vary depending on the provider. Still, despite some questionable click performance, email transaction rates and revenues are growing. Sophisticated marketers maintain that while email key performance indicators are important, they aren’t the full picture. As a result, marketers are instead putting more effort into understanding the holistic customer experience and how email contributes to it. Through big data and real-time optimization tactics, marketers are working to ensure emails’ relevance to the end user. Triggered messages, segmentation and personalization remain central to this approach. Marketers are starting to adopt emerging practices such as interactive email and predictive content, but they remain rare. "The share of total revenues attributed to email marketing is growing, according to marketing executives surveyed by OneSpot and The Relevancy Group. In Q2 2017, revenues attributed to email made up 21% of the total, up from 17% year over year."